I decided to replace the refined sugar typically used to make pumpkin butter with whole dates. 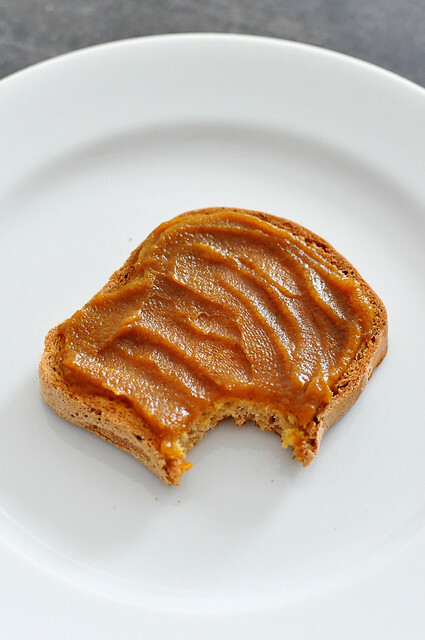 And since dates get thick and sticky when blended, I was also able to make this a no-cook pumpkin butter! 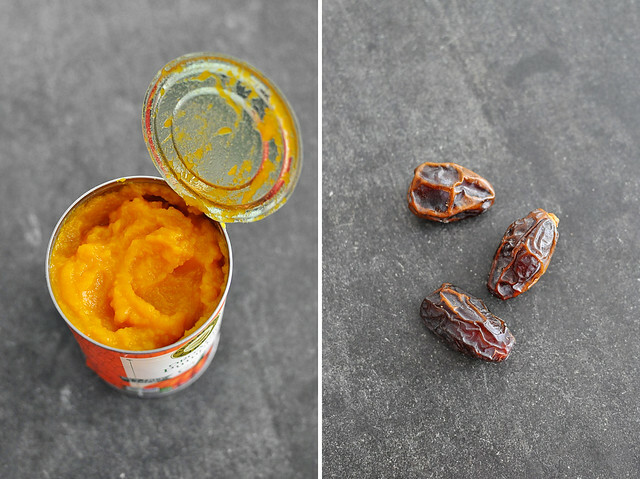 If you use canned pumpkin puree, it only takes about fifteen minutes from start to finish. I’d call it a win on multiple levels. This pumpkin butter is thick, smooth, and spicy. Its sweetness has a muted quality that I personally appreciate, but if you want to sharpen it up I have suggestions for that below. It’s delicious on toast, stirred into oatmeal, as a dip for fruit, or—as Roman prefers it—licked straight from your fingers. Place the dates into the bowl of a food processor fitted with the S-blade. Process to chop the dates and continue until they form a sticky ball. Add ½ of the can of pumpkin puree. Process until combined with the dates, about 1 minute. The mixture will still be chunky at this point. Scrape down the bowl and add the remaining pumpkin puree. Process until the mixture is totally smooth, scraping down the bowl as necessary, and no visible pieces of date remain. This should about take 5-7 minutes. Once smooth, add in the spices and the salt. Process for another minute or so, until combined. 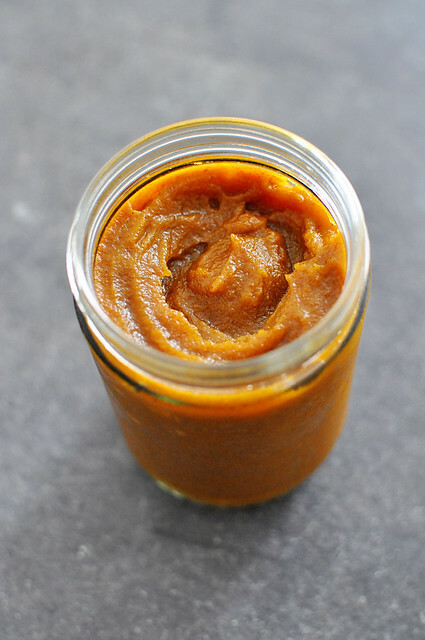 Transfer the finished pumpkin butter to a jar and refrigerate; it should keep for about 7-10 days. 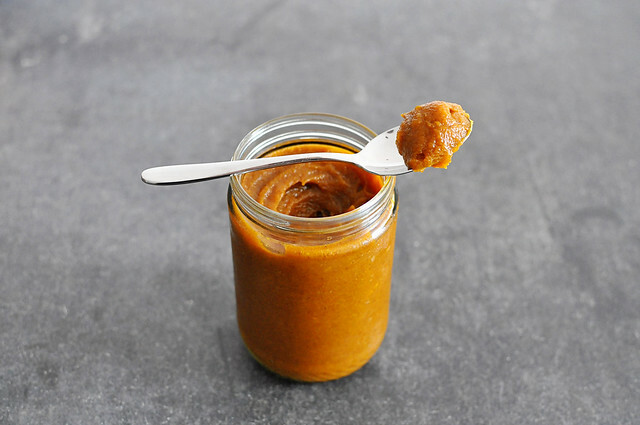 Because it's sweetened with dates, this pumpkin butter has a softer, more muted sweetness than traditional. If you find you're missing that sharper sweet quality, add a bit of maple syrup, about a teaspoon at a time, to taste.